Unlike ill-fitted removable dentures, implant dentures are fixed dentures for people missing their large number of teeth. Implant dentures are placed on a sturdy bridge of implant screws of 6 length which saves you from the painful experience of loosely fitted traditional dentures. It is several month procedures where the mouth needs to be prepared to place the implants. We will give some time for the bone and hardware to form a bond and set a strong for the dentures. 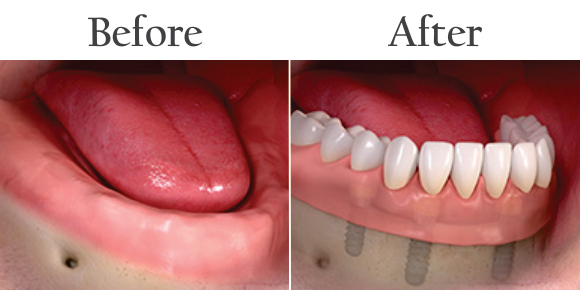 After ensuring secured placement of implants, dentures will be placed. People who are looking for a long-lasting solution and want to experience a better chewing experience, implant dentures are perfect for them. Implant dentures with 6 length implants are best especially in the case of limited bone density height. These implants will preserve your remaining jaw bone and are highly cost-effective in the long run. You’ll need any kind of creams and adhesives for fixed implant dentures and doesn’t require much care and attention compared to traditional dentures. After a thorough examination of your jaw bone density and height, you’ll be provided with a number of suitable dental options to choose from. Before the procedure, we’ll tell you the step by step procedure for you better understanding. After completion of the entire process, you are always welcome for any kind of problem in the future.